In this photo, Tuesday, October 30, 2018, Salesforce CEO Marc Benioff speaks at a SPUR lunch meeting in San Francisco. Benioff talked about corporate and managerial responsibilities for their communities, including the resolution of the San Francisco homelessness crisis and beyond. On this photo, taken on Tuesday, October 30, 2018, Salesforce speaks Marc Marcioioff at a SPUR lunch meeting in San Francisco. Benioff talked about corporate and managerial responsibilities for their communities, including the resolution of the San Francisco homelessness crisis and beyond. 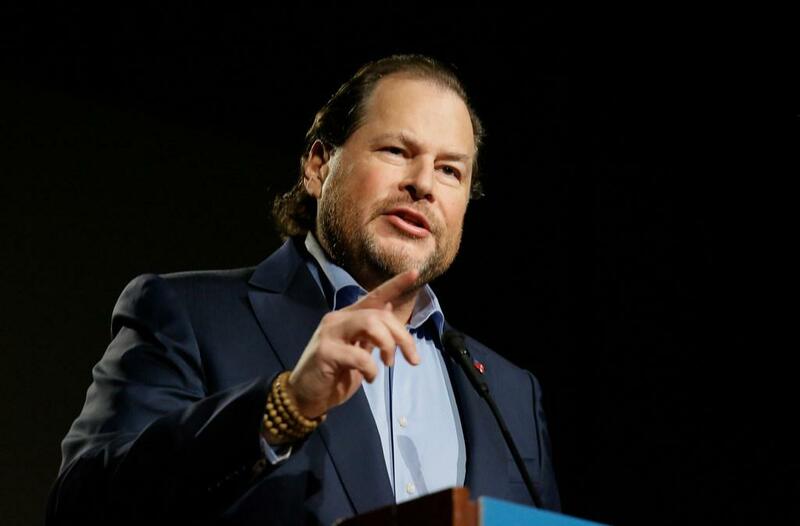 Salesforce CEO Marc Benioff called his home town of San Francisco a "train wreck" of inequality and he owed local technology companies as his owner in an interview at the World Economic Forum in Davos, Switzerland. "We have a real problem of inequality," Benioff said in an interview with CNBC. "It's because of the technology sector." Benioff continued to explain: "I think we have an incredible technology industry, one that every city in the world wants. But housing prices have increased. There has been wide gentrification. At the same time, we have a terrible homeless problem. Take care of the people who need us the most. " San Francisco has more than 7,500 people living on the streets, and Benioff has advocated increased city spending to remember them in distress, a champion of Prop C, a vote in November 2018 that Passed and promised to generate up to $ 300 million for homeless programs by raising taxes on large corporations. Dorsey and Benioff locked horns over voting on Twitter, when Dorsey wrote that he did not believe Prop. C was the best way to solve the homeless problem. He also said he was sidetracked by SF Mayor London Breed, who also opposed the bill. Benioff replied to Dorsey, "What homeless programs in our city do you support? Can you tell me what Twitter and Square & you are in & at what financial levels? How much have you given to lead home our $ 37 million initiative to get all homeless children off the street? " Benioff and Salesforce have donated to several San Francisco Bay Area reasons, including $ 250 million to support hospitals, $ 11 million to help the homeless and $ 50 millions to public schools. In his speech at Davos, he urged other business leaders to give more to their communities and say that inequality is "a problem every CEO should focus on." "Prop. C was a good example of where we had people who were very committed to getting it done and improving things in San Francisco, "Benioff told CNBC Tuesday. "Every CEO is responsible for their small part."